Skilled tradesmen with 15+ years of construction experience in Maine. Nate and team work together with homeowners to turn ideas into reality. Back Bay Builders is there every step of the way. Thinking of relocating your business to a new commercial space? Back Bay Builders will transform your retail or office space to help promote and grow your business. Building an addition on a home is a great way to customize the space to a family’s specific needs, while investing in the current property. Our team has the tools to help make the most of your most important rooms, optimizing style and comfort while increasing efficiency and value. Whether considering a complete renovation or simply updating fixtures to improve style and comfort, Back Bay Builders will help make your kitchen “wish list” a reality. Back Bay Builders are skilled craftsmen that know doors and windows inside and out. With 15 years of custom framing and finish carpentry, your friends and neighbors will notice the difference. When restoring a home, having a game plan is important. Back Bay Builders brings the experience, organization, and the aptitude to bring ideas to reality. Work with a company that keeps changes non-intrusive and compatible with the house’s design and style. Whether building a new deck or patio or freshening up an existing outdoor space, Back Bay Builders will help you bring indoor living to the outside. With over 15 years in the business, Back Bay Builders has what it takes to get the job done. We do not cut corners and leave all our job-site’s clean and organized daily. 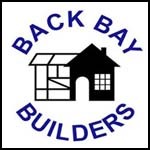 Back Bay Builders is a fully insured, experienced, and lead certified company. Back Bay Builder’s unique discovery process allows for the client’s budget and goals to come together seamlessly. Coming in with quotes at fair and reasonable rates is essential. Contact Back Bay Builders to get a quote and find out more. Accomplished, loyal and skilled tradesmen constitute Back Bay Builders’ unique expert team, all of whom understand the importance of minimal disruption and a clean, ordered workplace. Bay Bay Builders will work with you to schedule arrival and departure times throughout a project. After 15+ years of business this is an area Nate is particularly sensitive to—there are no clients with a “one time fits all” lifestyle. Nate and his team work together with homeowners throughout the planning and development of each project to ensure 100% customer satisfaction. © Copyright - Back Bay Builders, Inc.